Ahhhh Vitamin A how I love you. Our love affair started when you cleaned up my Acne scarring and has started again recently when my post baby outbreaks arrived. Here is my guide on why you should love Vitamin A (Retinol) too but why you need to respect this fabulous molecule too and some exciting news about the latest in Retinol molecules that we have available for you in house! It is the whole form of vitamin A. It’s a cell-communicating ingredient, so it communicates to almost any skin cell and sends messages for it to behave like a healthy, younger cell. It is an antioxidant, so protects your skin from free radical damage it regenerates cell growth, repairs damaged cells prevents wrinkling, increases collagen production and skin cell turnover. See why I LOVE it! Retinol (The whole molecule of Vit A) can be broken down into more potent compounds, which are called “retinoids” It depends on the compound as to whether it is safe for over the counter purchase or whether it needs to be prescribed to you. The molecules are small enough to penetrate the outer layers of the skin and then work their way down to the lower layers towards the dermis to have a physical impact on the Collagen fibres. Retinol also works to exfoliate from within, unclogging & refining pores as it does so. For Retinol to work effectively it needs to be converted into a Retinoid. A common retinoid you may have heard of it Retinyl Palmitate which is the least irritating form so used in a lot of over the counter products and while great, does take a while to have a marked impact on results. These retinoids have to be absorbed into the skin before they can start to communicate with the cells to repair the damage. Tretinoin – is prescription strength synthetic retinoid and not to be confused with your beauty product retinols. While effective it should be used in controlled, supervised doses & has a lot of side effects. It’s also important to mention Roaccutane – this is an oral, prescription strength vitamin A derivative for severe acne, which is very strong with numerous unpleasant side effects and not to be confused with our topical cosmetics with a touch of retinol in. We can work with clients while on this but would tread very carefully and where possible we try and prevent this course of action, deeming it as a last resort. Amazingly so! We opine this ingredient with others to give a holistic result. Q. Is Retinol good for spots and large pores? Yes! I’ve seen the evidence on myself and others. It’s important to realise that pores are not doors they don’t open and close and they are critical for ensuring the protective, if sometimes annoying, oil/sebum gets onto the skin to protect. What Retinol does is to refine them by slowing the release of sebum and by making the pores less sticky so they are more easily cleared of debris thus fighting outbreaks and Acne. With the exception of highly sensitised skins & Rosacea sufferers anyone can use Retinol (I always advice those who are pregnant to avoid). It’s important to start slowly & build up your use. We advise using a low level product containing Retinol first, every other night for two weeks, then to build to every night then move to a higher concentration of retinoid. 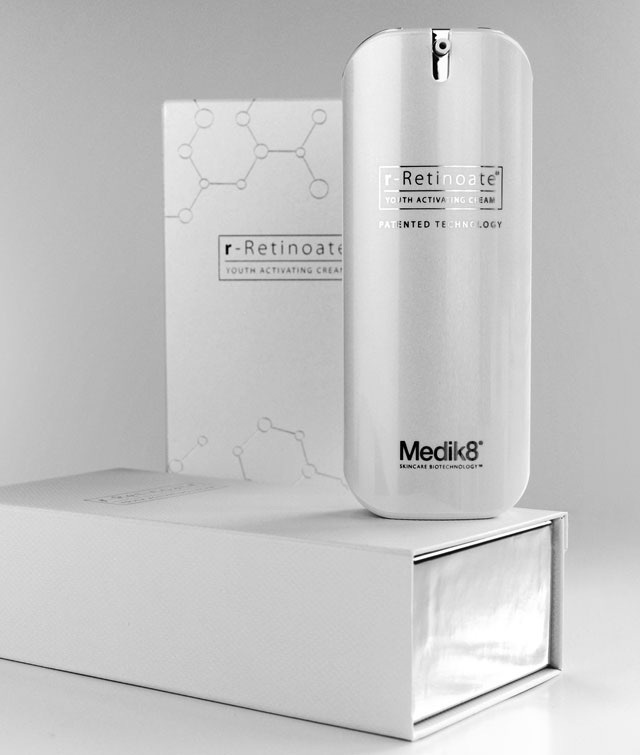 The great thing with the new molecule used in Medik8’s new cream, Retinyl Retinoate, is that it is less irritating, can be used day and night as it’s not affected by UV light and is clinically proven to be more effective then other Retinoids! Hurrah! We have had access to the amazing study carried out and published in the British journal of Dermatology. In my experience, you might see some visible results after 4 weeks especially when using this new molecule, however it takes an average of 3 months of regular use for the best results to be seen. Content Copyright © 2016 U & Your Skin LTD.